Become a vet and treat cute animals! 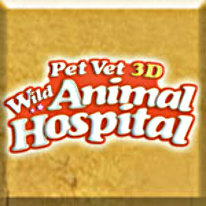 In Pet Vet 3D Wild Animal Hospital, you get to be the doctor for cute baby elephants, frisky zebra foals, adorable lion and leopard cubs and more! Help them get better by examining them, diagnosing their illness, and helping them heal. Get them on the road to recovery by feeding, training and playing with them. Earn a good reputation with pet owners and watch your vet business grow! You can even create your own look by choosing clothes, hairstyles, and even create your wilderness dream house!